Hispanic Heritage Month officially begins today! I'm so excited this time of year because suddenly there is a flurry of resources produced to help parents and teachers explore our heritage. There is so much creativity flowing that it's hard for me to keep up with all the crafts, books, activities, and other materials published. This year, I'm really happy to have been asked to kick off Multicultural Kid Blogs' annual HHM celebration. I chose to write about why Hispanic Heritage Month is a vital event for our country. I often hear Latinos complaining that we shouldn't have only one month dedicated to recognizing the contributions of Hispanics to our country's history. That it is something that should be recognized year round. I totally agree, but the reality is, that if we didn't have this month-long observance on a national level, then we wouldn't have one at all. And our voices would continue to be smothered, the contributions of our ancestors ignored. 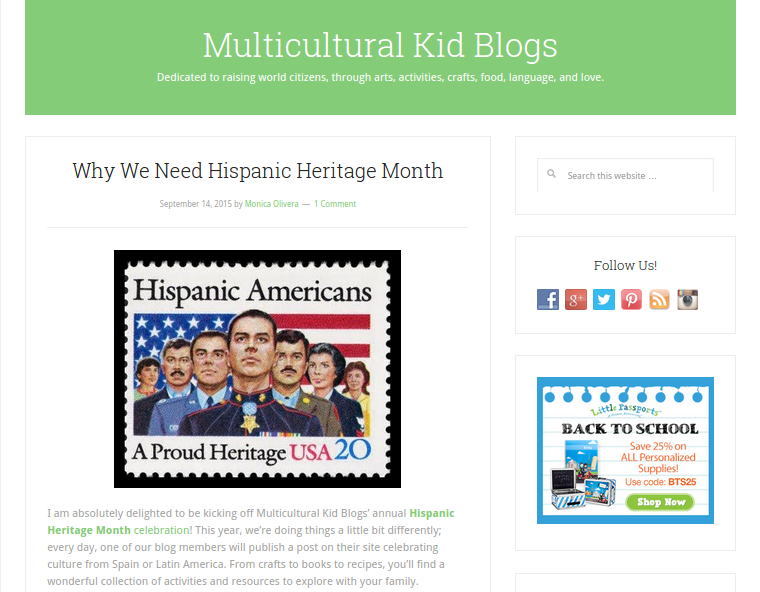 So take a hop on over to MKB to read my thoughts on why we as a country need Hispanic Heritage Month. Let me know what you think - are you for or against it? Why? Oh! And while you're there, don't forget to sign up for the incredible giveaways they have going on! There are three fabulous gift sets.